This equipment is dedicated to the engine intake pipe sealing detection. According to the requirements, with gas detection and bubble water detection combination of methods, nonconforming unified bubble water tracing detection, determine which physical location. 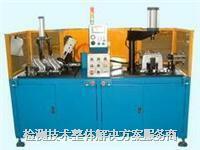 Through changing the special jig realize many varieties of workpiece flexible detection.